I made this card to encourage a young lady at Navy Boot Camp, and let her know how proud we are of her. The primary colors in the card are navy and gold for the Navy and the signal flags spell “GO” (the ones in the butterfly hands) “NAVY” (on the rope). The butterfly, from Birthday Bash, is cut at 2.5 inches tall. I glittered her wings with some chunky clear glitter and “spit shined” her boots with Glossy Accents. I printed the signal flags and hand cut them. It’s a nice flat card to make sure it reaches her as I wasn’t sure about mailing a small mailing box to her while she is at boot camp. I hope this card will brighten her day at mail call. I love the flags and that they spell out Go Navy. You are just too clever! A nice way to send a cheerful note. I like the boots and the butterfly holding the flags. The whole card is great. Go Navy! Colorful and fun! Love the flag message and I especially love the boots on the butterfly! More expertise in pattern useage and colors that pop– your absolute specialty! What a wonderful card! 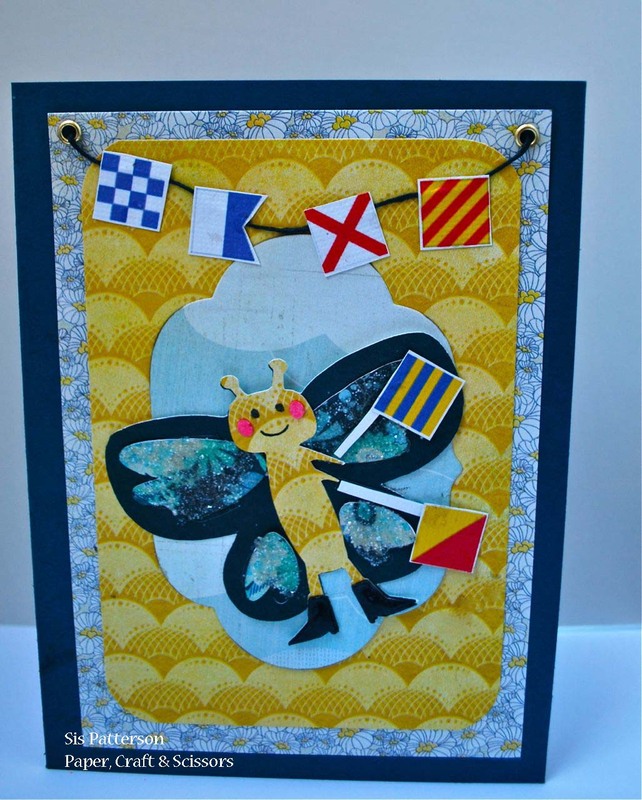 Love the signal flags and that butterfly is too cute. I’m sure it will brighten her day. Great card. I love how you did the flags and the meaning. I have returned to this post several times today to get ideas for the card I made for her! So glad you posted this first or I would have had no confidence at all! You have symbolism nailed on this with the butterfly, colors, and flags— I worked so hard not to use those signal flags, fighting it all the way. That was particularly brilliant! Thanks, Nadia – comments are always appreciated! And I was beginning to think no one understood the butterfly so thanks for that! Your card is AMAZING! I really love everything about this card. You did such a fantastic job, I bet she will treasure it.